Happy National Running Day to all! I had a fabulous run today. 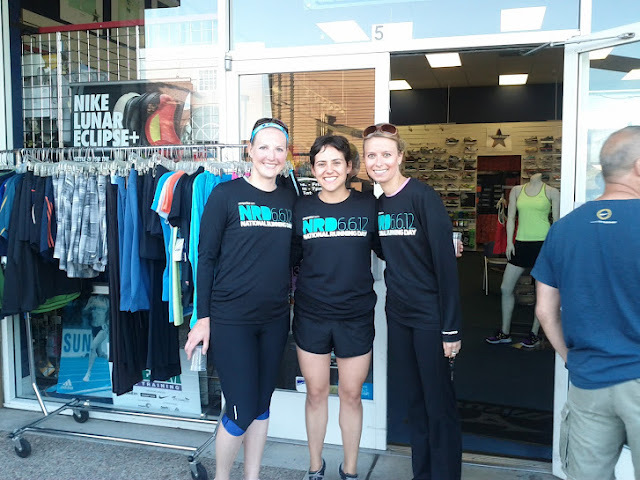 A friend invited me to her recently found running group at Running Revolution in Campbell, and they were having a party complete with pizza and t-shirts for the event. We met at the store and headed out for a short run along the Los Gatos Creek trail. At first I didn't recognize it from where we entered, and I told someone I'd never run there and asked what trail it was. When she told me, I realized I had indeed run there before, most recently 20 miles on Saturday. I ran with my friend for a bit and then backed off my pace, where I met a fun new person to run and chat with. We followed the trail and the group, talking and running, and soon realized we didn't see anyone from the group anymore. Yep, we took a wrong turn, missed the bridge to the park and went about a mile more down the trail. Call us the overachievers. We totally meant to go farther. As it turns out, the planned run was only about 2.3 miles anyway. We ended up doing slightly over 4 miles and had a great time. I'm so happy to meet a new group of runners in the area, which I really didn't make a priority when I moved to California. I'll be going back to the group for their normal Tuesday runs starting next week. They run from Rockbottom Brewery and finish with beer. Now that's my kind of group! Last but not least, we received these awesome Brooks long sleeve t-shirts for the event! Now that National Running Day is over, I need to get on the taper train for Seattle. I've been very bad about reducing mileage this week so far, but it's been so much fun! The shirts are great! I am definitely feeling sad about missing it, even though I know that it is probably for the best!